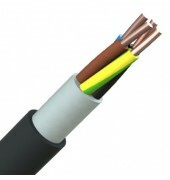 An economical form of power and control wiring with no requirement of mechanical protection. Can be used indoor and outdoor for direct burial or through ducts- local regulations permitting. Highly required due to size, weight, and cost saving element. Plain copper conductors to IEC 60228, PVC insulation, bedding compound, black PVC outer sheath.Can be supplied with green/ yellow earth conductor.